Father Ahern anointing Alessandra Sommers, a Lourdes malade in 2014. Seated to the left is Leon Plochocki, a malade from 2010. On the evening of Thursday, July 17th the Syracuse Region hosted an Anointing Mass at Stella Maris Retreat Center in Skaneateles, NY. 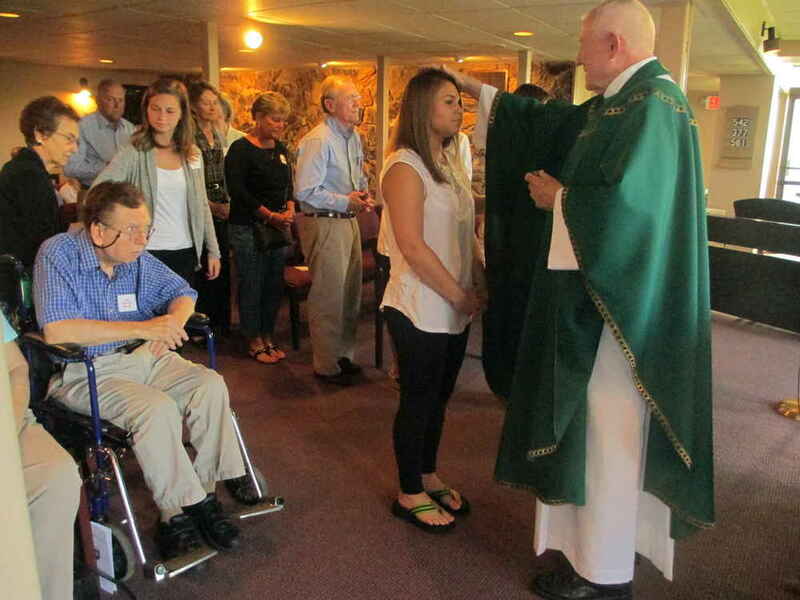 Our chaplain, Father Ahern celebrated Mass and anointed all who were there in need of healing. Father Vavonese, who often accompanies the Order to Lourdes, concelebrated. In addition to the Knights and Dames there were twenty three malades and members of their families in attendance. The Mass was followed by a dinner where malades were able to enjoy time with many of the Knights and Dames with whom they had been in Lourdes.